Germany, Netherlands, United Kingdom, Peru… in the past month, we’ve already shipped hackAIR sensors to fourteen countries worldwide. 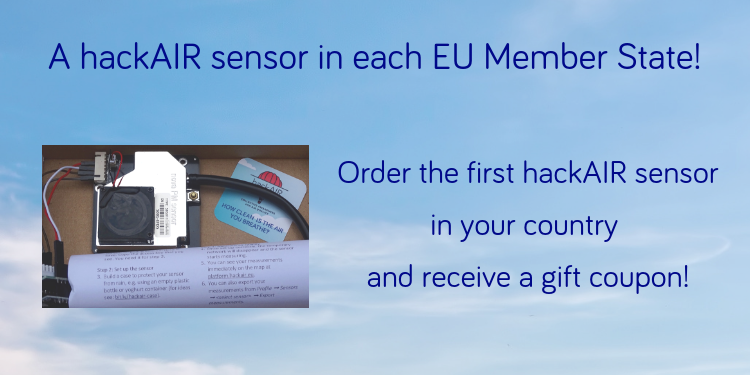 Let’s make this happen, together: a hackAIR sensor in each EU Member State! If you are a resident in one of the following countries AND if you are the first in your country to order a hackAIR sensor through our website, you’ll receive 5€ off your order. It’s easy – just as easy as to connect your new hackAIR sensor to your WiFi. Find your country in the list. Copy the coupon code. Go to the product page, and order your sensor.Enter the coupon code at check-out. Your payment will be 37 € instead of 42 € (plus shipping). Interested? Then: order your sensor today and be the first in your country! Current status (2 November): 15 countries to go. We will update the list regularly and also share updates through social media!